What did the bad guy ever do to you? 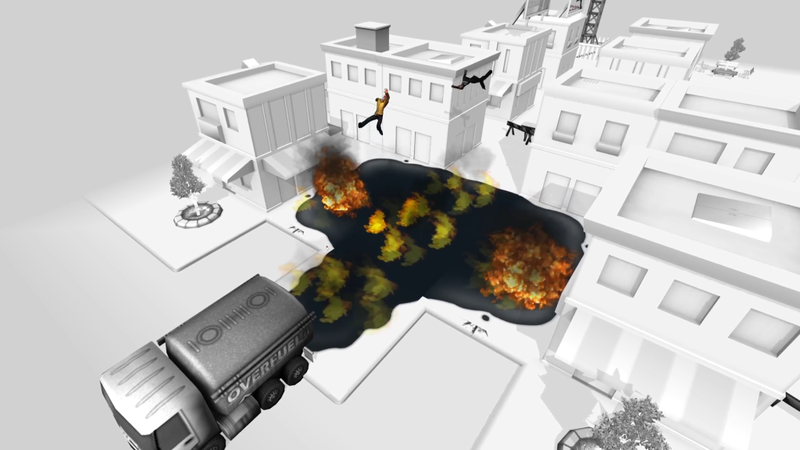 As you’d expect with a title like Kill The Bad Guy, the goal of each level in this game is to rid the world of a horrible person, guilty of some evil wrongdoing; whether that be murder, prostitution, or doing backstroke in a crowded pool – the worst of all crimes. Doing so requires no action-packed shootouts or epic questing though, it’s simply a case of solving a puzzle, but the end results are still messy. Each level presents you with an isometric view of a small black, white, and grey area, which contains not only a Bad Guy travelling his set path on repeat, but a selection of objects that can be combined, interacted with, and positioned to create a deadly trap for him. 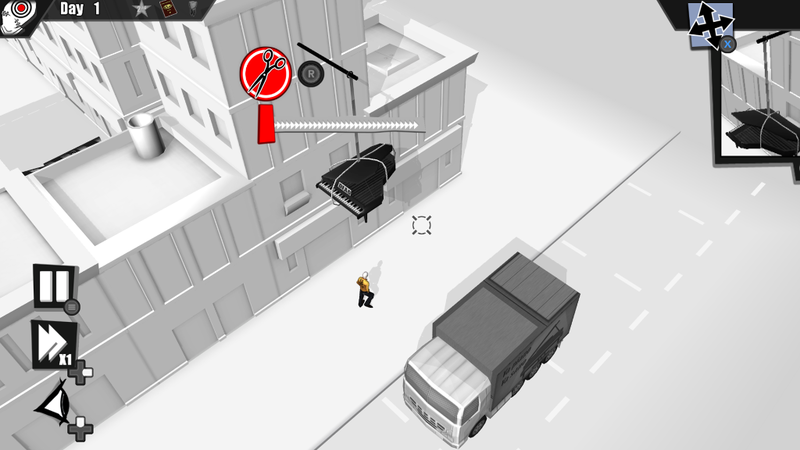 Initially these start off simple to teach you the basics: tamper with a car and floor it to run him over or tie a piano to a building and cut the rope, but quickly become more complex by adding in cameras, bodyguards, and witnesses who you can’t let catch you in the act, or having you place objects to force the Bad Guy down a certain route before offing him. At times there’s a real challenge, meaning you’ll likely end up facing some of the levels over and over which can prove frustrating when your failure comes about because the finicky AI reacted to a situation differently than you expected or than they had previously – a problem that multiplies the more AI are placed in any given level. The fixed camera also creates another source of annoyance, making it awkward to aim and drop objects accurately and causing you to miss your target by a hair, not only failing to kill him but alerting him to your presence and ending the mission. Trying out the different methods available to you and steadily getting closer to a solution is very satisfying though and disturbingly so when you’re simultaneously smashing someone into a bloody mess with a rogue wrecking ball. It sounds dark, but there’s a comical tone to the whole thing allowing you to lure your target into traps with dirty magazines, or distract civilians by catapulting fruit at them. This is particularly evident when you pause to read the background information on each target on the level select screen. These are regularly quite funny, often making vague references to a host of historical and pop culture figures. At the time of writing I’ve offed both Vader and Voldemort as well as lovable Hitman, Agent 47, and given Saddam and ol’ Adolf himself their comeuppance. It would have been a nice touch if these famous faces had looked like their counterparts but sadly, they’re all the same. In fact, aside from the layout of objects and buildings within them, there’s no variety between the 60 main levels with the same monochrome palette persisting throughout. You won’t even bother about that though as the incredibly repetitive soundtrack will have already driven you mad in even a slightly lengthy play session. While the effort put into the rap theme song is admirable, playing it on every menu and at the “mission failed” screen is a bit much. For all you completionists out there, each level features four secondary objectives adding up to a five star rating. There’s an additional layer of puzzle here as, in each stage, one of the objectives provides only a cryptic clue to what must be done to achieve it, while the other three are consistent across the board, tasking you with finding a stolen passport, completing the mission in one day and catching each Bad Guy’s tooth as proof of his assassination. Collecting these stars then unlocks a bonus level in each chapter, but these are usually throwaway minigames (featuring an Angry Birds clone and a zombie defence stage among their highlights) that you likely won’t care enough about to try and unlock. The backbone of Kill the Bad Guy is a unique and entertaining idea, having you solve puzzles and murder evildoers all at once while keeping the tone light with its comical elements but the flaws hold it back from being truly enjoyable, particularly later on. The repetitive soundtrack and level design also means you won’t want to play more than a few stages at a time. 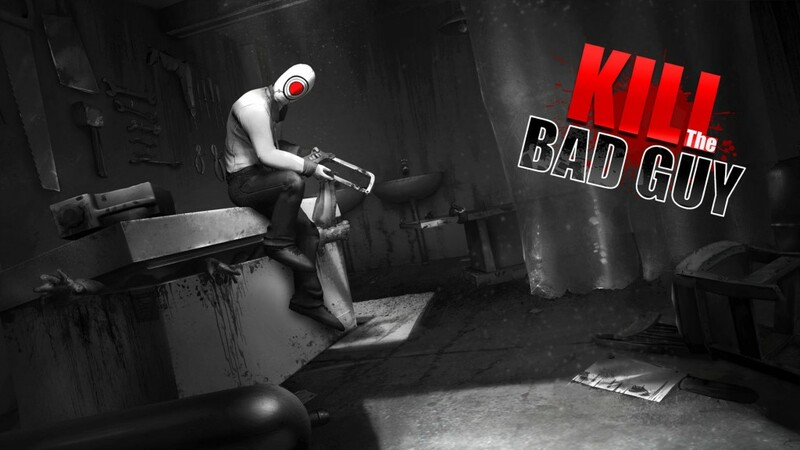 Kill the Bad Guy puts a unique and violent spin on the puzzle genre with some success, but the repetitive level design and soundtrack won’t keep you coming back.